Drumrolls for the pretty ladies from the Chef at Large Blogger’s Table who met for the table’s first joint review in Kolkata! For the uninitiated, the CaL blogger’s table comprises a group of food bloggers who meet up and jointly review the place at the end of the day. Its an impressive concept wherein not only restaurants benefit by getting reviewed at one go, while bloggers get to let their hair down in like-minded company of their fellow bloggers. In fact the CaL table has been active and quite popular in Delhi and Bangalore, and ain’t I glad we are finally doing this in the city that’s known for its food, Kolkata. 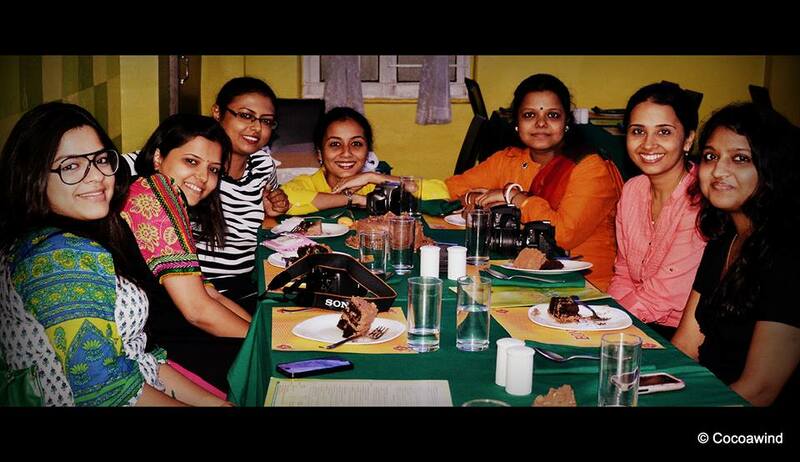 Big thanks to Kamalika who brought the fabulous Kolkata Food Bloggers under the same roof and introduced me to them. Our choice of the restaurant for the first review was not really the result of much contemplation. It just seemed like a cute place from outside, plus it announced of serving pork and goan food, my two major weaknesses, so I had always wanted to visit it and try it out. My bro who is very snooty when it comes to both pork and goan food, and believes noone makes it better than him, chose to ditch me everytime I proposed to visit Bongoan. Luckily for me, the table members agreed..and then we met. I was meeting each one of them (except Megha who now writes for CaL) and was super excited about it. Caught a bunch of giggly girls at a table, and knew at once it was them. 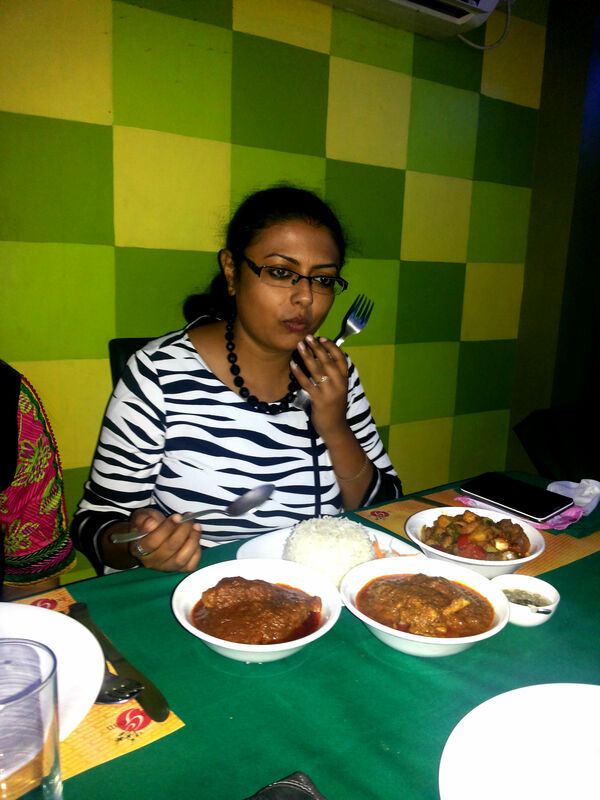 We waited a while for Megha and Sarani to turn up, before we placed our order. Sweet corn chicken soup: We thought it would be safe but this was below average. There was a funny smell often associated with stale creamed corn. Lottye fry (batter fried bombay duck): Batter was too thick. Not crispy enough. 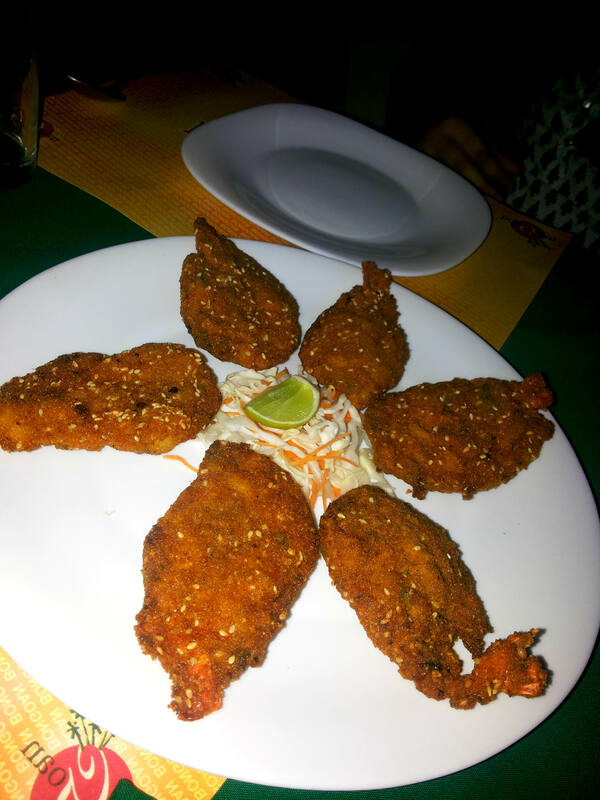 The fish was not deboned as is usually the norm in Goa/ Konkan from where they may have got inspired. Sesame fried prawns: This was really good. Prawns were fresh and juicy, well marinated in what felt like a garlic-chilly-coriander paste. Crisped to perfection. Spicy chilly babycorn: The baby corn was crisp, I have to give it to them. But it was way too spicy even for a spice veteran like me. But of course, spice is a relative term and I cannot hold it against them. 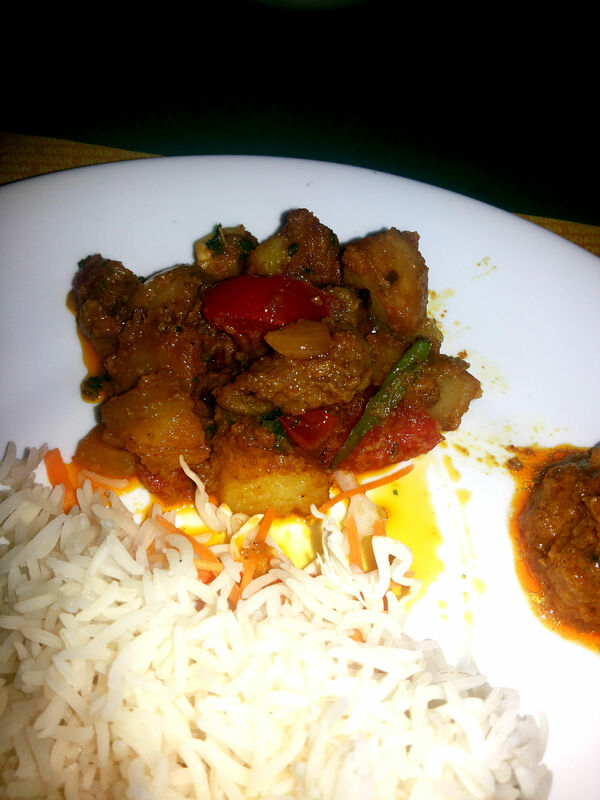 Pork Bhuni: I almost felt guilty for hankering the rest to order this, based on some online reviews. It looked good, with chunks of pork and fat, bhunoed with cubed potatoes, tomatoes and onions. But it did not taste as I was expecting it to taste. There was no cohesion in the taste of the pork and the vegetables. The chunks of meat were chewy and the cubes of fat needed to melt a bit more to release their flavours into the veggies. The reason I am elaborating it is because this dish has potential. Mutton Vindaloo: We had looked forward to this dish too, knowing very well that it would be strong in taste, closer to a pickle than gravy, high in vinegar. But in reality, it tasted only of vinegar which completely overpowered all the other spices that went into it. That’s not how it is supposed to be. Bebinca: Biggest disappointment of the evening. Originally expected to be a layered cake tasting predominantly of coconut cream, jaggery and ghee/clarified butter, all we actually tasted was what seemed like chewy sugary gum paste topped with, for some strange reason, sticky caramel. I understand it can be difficult getting this one right, in which case, it should safely be dropped from the menu instead of serving a makeshift item. Long story short, the food was highly inconsistent in quality. 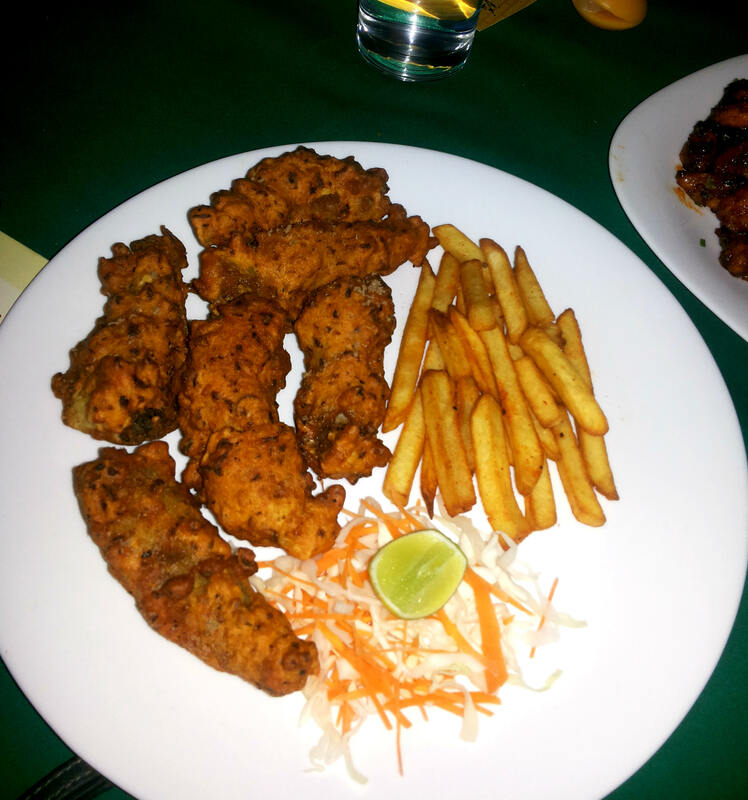 I could, however, go back for the Chicken Xacuti and Sesame fried prawns, but given that they are the only place that has started serving goan food in the city, I would really urge them to pull up their socks, do a ground check on goan food and revisit some of their recipes. The service was pleasant and attentive but unimaginably slow by any logical standards. The ambiance is not too bad, though I would have liked to see my food without the blue lights. We have a tough time photographing the food and avoiding looking like blue zombies in our photographs. I have always loved the external look of the place, very enticing, I maintain. Thank God for this lovely cake Sayantani had baked for Kamalika whose birthday it was, the day after. 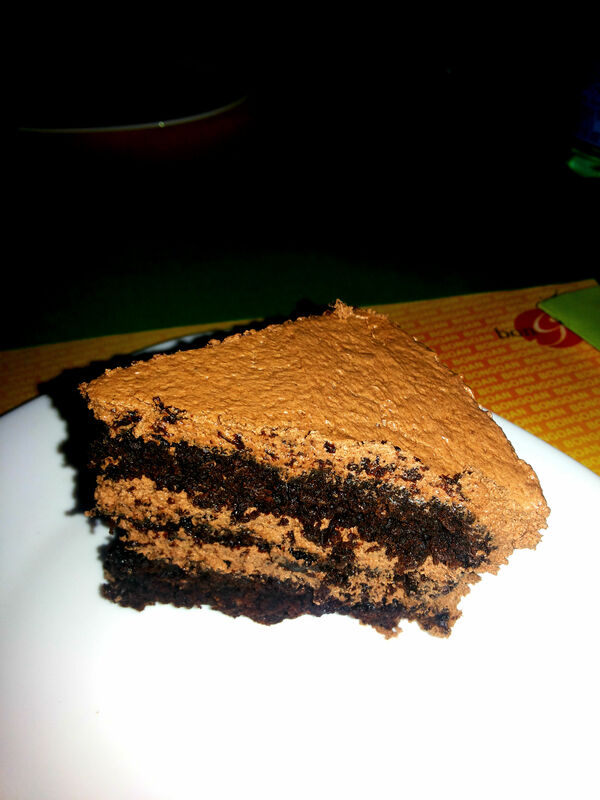 Now that kolkata CAL Table is firmly established…looking forward to seeing more restaurant reviews!!! Pingback: Chef at Large – Indian Food Network | Goan gone? Pingback: Chef at Large – Indian Food Network | Best pizzas in town?